Back in the 1920’s my father had an export business… Russell Vogler Export Co. He exported logs to Japan. He was financially quite well set. He had a new home built at the corner of Angus and Forty fifth in Vancouver, and we moved there when I was three years old. I was a little too young to remember, but I was told! With his business, he had to “get up with the tides” and go to the booming ground. Mom always got up with him and made sure he had breakfast before he left. Mom was a morning person. So am I, but not as much as she was. She would have pies, or other baking done before anyone else was up. She looked after the house, with no outside help. She had some hobbies to keep her busy! One of these was painting on china. 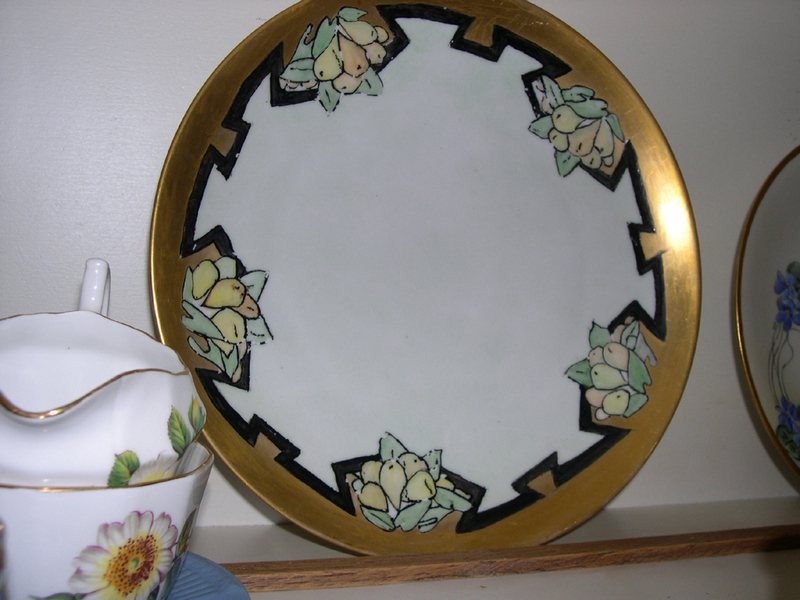 She had patterns that she would trace on the china wear, and then paint them. I think this was when I had started school, so that she could work in peace! Years later, on one of my birthdays, she gave me a whole set of hand painted china! I still have some of it, but it is on a shelf over the stove, and I can’t reach it. Luckily, I have pictures, so I can enjoy them without getting them down from the cupboard. In 1928, when the stock market crashed, they were caught up in it, too… so dad moved our family up to Beaver Valley, in the Cariboo where we could “live off the land” for a few years, before moving back to Vancouver. 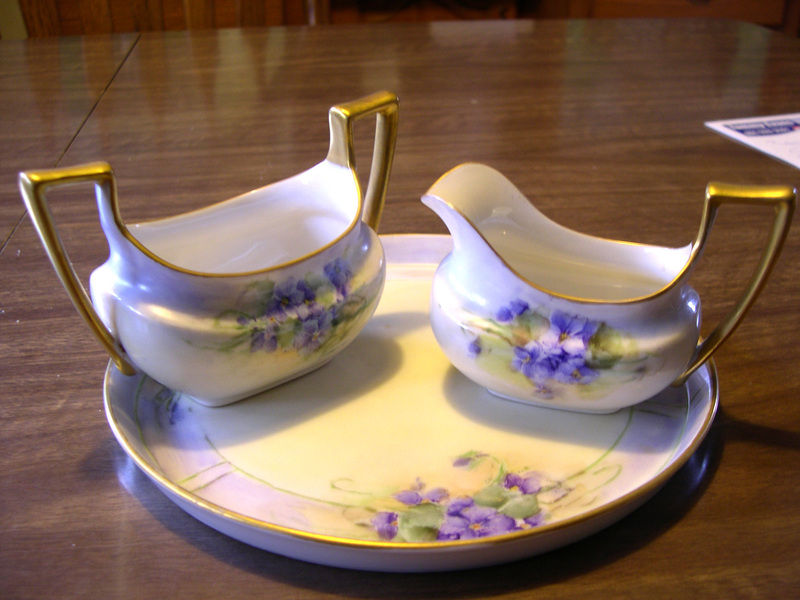 My grandmother painted china, too. I remember Saturdays when her painting groups (about four other ladies) would congregate. We’d have ham and beans in the deep well on the stove and salad in the refrigerator. The cornbread would go into the oven about 11:30. And the ladies would paint from nine in the morning until after three in the afternoon. Every possible horizontal surface was covered with half a dozen layers of newspaper. And I was even allowed to work on some small pieces. I must have been all of twelve. Great memories. Your mother’s work is beautiful. Hi Judith, I’m glad that you are remembering back, as I am. I don’t remember seeing Mom paint. Re: It feels like I have known you for a long time, too! Hi Dave! What a nice surprise to see you visiting… you just missed tea! Maybe next time! I appreciate your comment….makes me want to keep blogging! It seems you inherited your artistic ability from your mother. Her painting on china is beautiful! It’s nice to have you back here sharing memories about your family. Thanks for visiting and for your comment, Carol.We shouldd have a cup of tea… I even have some cookies! Good afternoon, Heather. Great to have you stopping by and commenting. How about joining Carol and me for a cup of tea?